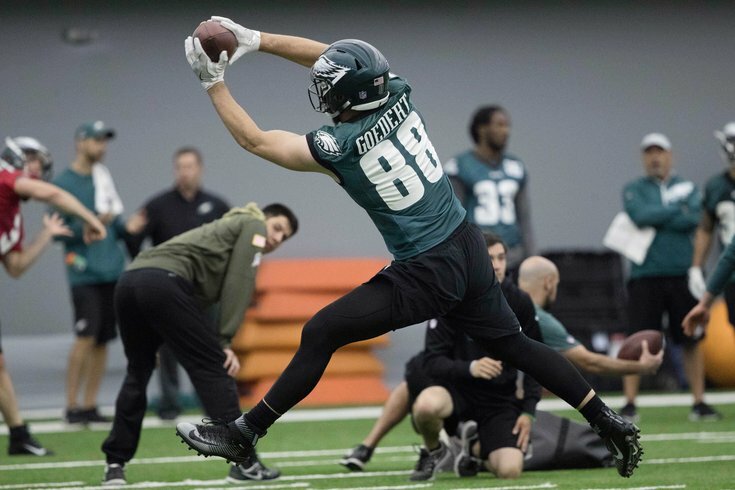 Philadelphia Eagles tight end Dallas Goedert (88) makes a catch during organized team activities at NovaCare Complex. The second week of Eagles OTAs kicks off on Tuesday at the NovaCare Complex, and despite a break for the holiday weekend, there's plenty to talk about when it comes to the Super Bowl champions. • Angelo Cataldi is here to throw some ice cold water on your Memorial Day BBQ with his latest column on why you shouldn't even bother getting excited to see Carson Wentz in Week 1. • Jimmy Kempski offers up his first Eagles 53-man roster projection, even though it's way too early. • There have been a lot of Birds going under the knife this offseason, so Jimmy provides an update on each Eagles player recovering from surgery. • Evan Macy has more on Zach Ertz, who (like every Philadelphian not named Angelo Cataldi) is optimistic about what he's seen out of Wentz this week. • Lane Johnson is still hungry. • And, finally, here's Kempski's weekly mailbag. The Super Bowl champs lost two important contributors (Vinny Curry and Beau Allen) from the best unit on their team, but somehow their defensive line might actually be both better and deeper than it was a year ago. They brought in Haloti Ngata to play a run-stuffing role on early downs and swung a trade for Michael Bennett that gives them yet another versatile piece who can play anywhere along the line, in any situation. Add to that the drafting of the underrated Josh Sweat and what was arguably the best defensive front in football should still be quite strong in 2018. They replaced Torrey Smith with Mike Wallace and drafted Dallas Goedert to replace Trey Burton. The loss of Patrick Robinson in the defensive backfield will hurt, but healthy seasons for Ronald Darby and 2017 second-round pick Sidney Jones should help mitigate his absence. Plus fourth-round pick Avonte Maddox has elite athleticism and could turn into a real player with time. The Eagles were able to pay and keep Nick Foles just in case Carson Wentz's rehab doesn't go exactly as planned, and they didn't screw up their cap situation to do it. If they're really as confident in Wentz's rehab as they say they are and still turned down the No. 35 pick for Foles, that was a mistake. But this team did everything else well, so they get what is easily the division's highest grade. Skinny: Treggs appeared in nine games as an undrafted rookie with the Eagles in 2016 and spent some time on the Browns’ active roster in 2017. He’s back in Philly with hopes of cementing a roster spot. Like Gibson, Treggs has the type of speed to stretch a defense, and he’ll need to further develop his skill set to stand out in a crowded wide receivers room. Everybody’s favorite backpack kid dancer Mack Hollins comes first on the breakout radar. Hollins didn’t exactly have a monster rookie year, but he did have flashes at times. His final stat line for the regular season was 16 catches for 226 yards and a touchdown. So, he wasn’t precisely the rookie of the year, but he didn’t look so bad for not being anything more than a backup in year one.